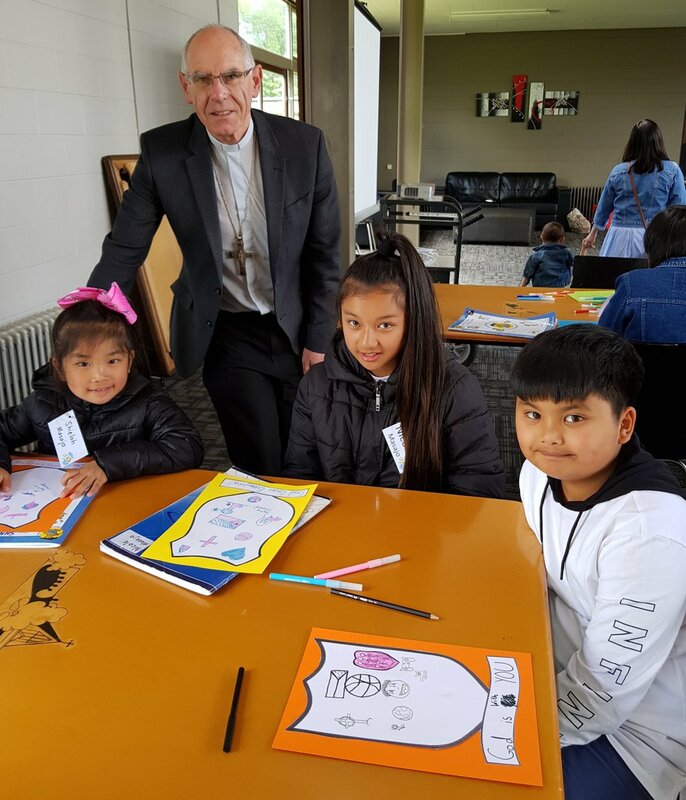 On Sunday 11 November an excited group of rural children gathered from around Southland at Rosmini House, St Peter’s College Gore, to learn about ‘Being Church Today’. Meeting only twice a year it is a time to rekindle friendships already made and welcome new friends as well as a time to deepen their faith. We were delighted to have Bishop Michael spend the day with us, joining in conversation to explain how he designed his crest and later celebrating Mass in the college chapel as well as joining in with our lively singing. A most capable team of senior students from the College led the two groups in Scripture and Prayer/ Craft Sessions where they investigated how we can carry on Jesus’ work of loving and serving those around us, and made their own crests to represent things special to them that they can share with others. This time parents joined in with the children’s sessions to make it a true family affair as well as establishing a rapport of support to carry back to their more isolated communities. Now well into our seventh year of Bushy School Days we are aware of the importance of helping to maintain a network for Catholic families in small rural areas, and also being available for any family unable to attend a Catholic primary school. If you know anyone who may like to join our group please contact me at [email protected] or text 0211650862. Bishop Michael chats with Shieloh, NIcole and Kyle Masajo about the crests they are designing. Teaching our children to pray is a precious tradition in our Catholic faith. Precious, but not always easy in this modern time of so many distractions – television, digital devices (ours and theirs! ), and the many after-school activities on offer. Objects that help me to Pray Setting up a special space in their bedroom using pictures, prayer cards, flowers, a candle (battery-type), a children’s bible, rosary beads, crucifix – being selective to arrange on a cloth. Praying through Dance With access to a CD player or laptop to play peaceful music, many options are available to download from the internet to listen to and then create a routine of movements. Praying with Scripture We learnt about ‘Imaginative Prayer’ where after listening to a passage of Scripture the children are drawn through discussion to imagine that they were actually present in the scene, and to consider what they might have said to Jesus and what he might have replied in turn. Senior children looked at a variety of prayer-styles on-line and were guided through steps to create their own prayer, generating an awareness of ways to utilize their IT skills in a prayerful way. Centring Prayer A quiet, calm time where the children relaxed on bean bags letting their minds fully relax while listening to a meditation CD, opening their minds to prayer by listening for what God may say to them. The children could adapt this to a quiet time of prayer at their own prayer space from above. Children were able to take home a set of ‘prayer starter cards’ which I am happy to make available if anyone wishes to contact me through my details below. A further distribution was made from religious books generously supplied to Bushy School families by diocesan Catholic Primary Schools. Grateful thanks once again. Parents were encouraged in a talk by Jo Bell, of Dunedin, to look for ways to incorporate spontaneous prayer into their children’s lives as a response to beautiful moments in creation. Jo introduced parents to the Diocese’s new website www.faithjourney.co.nz developed especially to help families with children not attending a Catholic primary school. A phone app ‘Pray as you Go Examen for Children’ is another good tool using technology. The success of the day is again attributed to the voluntary contribution of time by those lovely people who gathered to share their faith with the next generation, as well as the amazing team of St Peter’s College students who braved the day after their school ball! A great resource to use at home is the Family Whanau Book. This is available online by clicking here or on the little image below. This book is usually used along side a school Religious Education Program but can be most helpful for those learning about their Catholic faith at home. It is divided into school year groups so you can choose the year for your child or children and look at that material. In term 4 schools will be looking at the Communion of Saints Strand, week 4 will be All Saints and All Souls in the Liturgical Year Strand, then back to Communion of Saints and in week 7 The liturgical Year for Advent and Christmas. Hope this is helpful to you. Try out this fantastic new web site. Faith Journey. Great for families and all those who would like to be inspired. Easy to use from home. Amy Young, Laura Paterson and Sophie Parris from the ‘Tui Group’ perform a dance of prayer to ‘Prayer of Peace’ by David Haas supported by Ella McGuigan, Maggie Nicholson and Faye Hanna. Katrina van de Water, CEO Advisor, supported by Gianluca Frei, guides Alex Mackay, Kayla Barker and Andrin Frei through an on-line prayer format. Tim Barker, of Tokanui, with his children Kayden and Kayla show appreciation for books received from Catholic primary schools in our diocese. My name is Bernadette Weller and my 3 daughters and I have all attended the Bushy School Days over the past 3 years. While my oldest daughter is now at St Peters College in Gore, the younger two are still at Riversdale Primary which is a Year 1 to 8. Our reasons for attending Bushy School are varied, principally it is to allow the girls access to a religious learning environment around Catholic principles, which they miss out on in a secular school. It also gives the girls a sense of belonging to a community. While we are lucky in Riversdale that there are other Catholic families with similar aged children, generally the Catholic population in the country areas are older, often elderly and so a day set aside for just families helps reinforce that sense of belonging for the younger generation. It helps certainly that we are always treated to delicious food, the kids keenly anticipate the cupcakes and baking and the older St Peter’s students are always there to make things fun. The day is mixed up with a variety of craft, music and learning sessions and this variety helps keep the varying ages focused. I have enjoyed meeting the other families from around Southland, and we always find we have much in common. Hello we are the Dennis family from Te Anau Dad Brendan, Mum Netty, Katie 9, Jack 7, Gracie 2. We love to travel to Gore for our Bushy School Days as we have no Catholic studies in our local area. We love to meet other Catholic tamariki. Having fun with craft, singing and games all while learning about God.